Found 22 blog entries about Simpsonville SC Real Estate. Friday, May 1st, 2015 at 12:39pm. This month we're featuring a couple of homes from the community of Simpsonville, SC. This manufacturing town features a strong local economy, which has allowed it to grow to the vibrant city that it is today. CUSTOM BUILT HOME WITH IN-LAW SUITE/ Full Finished Basement on 0.76 ACRE! Monday, November 18th, 2013 at 6:03pm. Monday, September 16th, 2013 at 2:07pm. REDUCED $20,000! Beautiful Home In Asheton Springs! Friday, July 26th, 2013 at 12:53pm. Looking for a fantastic deal in a great location? Check out this huge price reduction in Asheton Springs at 104 Red Branch Lane, Simpsonville, SC 29681. Now only $399,900! Asheton Springs Executive home is Ready to Move In! Want a lower maintenance yard to care for but don't want to sacrifice on the quality or the space? This 4 Bedroom, 3 and Half baths with Bonus Room has tons of extras....Including a 3 Car Garage! From the moment you walk into the front porch you are greeted by the double arched mahogany doors which adds to the curb appeal of this home. New Homes Division Sales Manager Hired! Monday, November 19th, 2012 at 8:11pm. 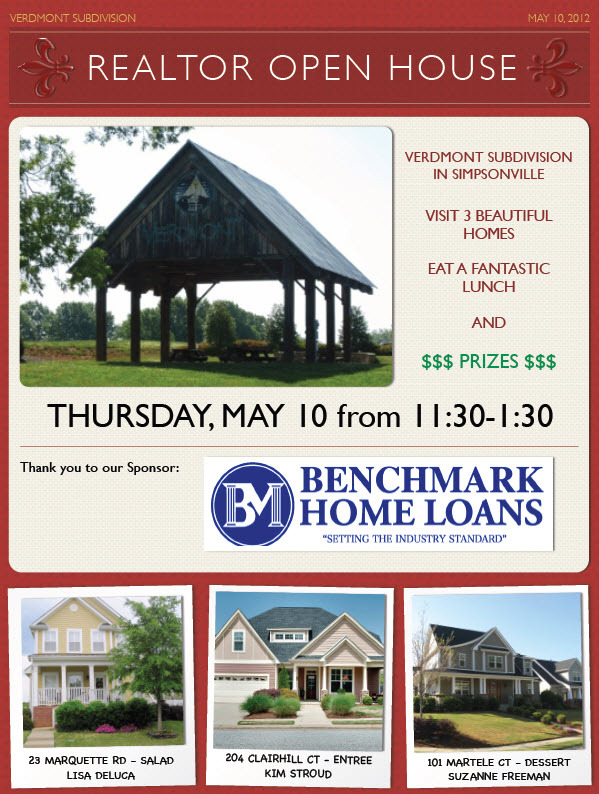 Join us for a Realtor Progressive Luncheon in the Verdmont Community in Simpsonville, SC May 10th! Wednesday, May 9th, 2012 at 9:32pm. For those who qualify, USDA Rural Housing can help put you in a Verdmont home with zero cash down (100% financing). Call Lisa for details at (864) 915-8547! Are Home Values Listed on Zillow Zestimates Accurate for Greenville SC Market? Thursday, April 26th, 2012 at 1:01pm. When I speak to homeowners who consult with me before listing their home for sale, I find the first thing they ask or want to know is, "What Is My Home Worth?" Well, that is a simple question with a potentially complicated answer. I will usually turn the question around and ask them, "What do YOU think Your Home is Worth?" I do this because I want to understand where are they at mentally in the process of selling their home. At this stage, most homeowners have not emotionally detached themselves from their home to look at it analytically (as a house) and, in many cases, will overvalue their home's worth. In Real Estate, What Does, "Location, Location, Location" Really Mean? Wednesday, April 25th, 2012 at 11:21am. The age old motto of real estate is, "Location, Location, Location!" At Delco Realty Group, we bring context and relevance to what is important to Buyers when they start looking for their next home. For our Listing (Seller) clients, it is very important to understand this as well since we utilize the human element of buyer behavior to build a custom marketing plan to selling a home based on this motto. Tuesday, March 6th, 2012 at 7:26pm. Developing a marketing plan to sell your home requires a unique one-of-a-kind strategy that specifically works for YOUR situation as a seller. We can incorporate proven marketing techniques for today's challenging environment, however each marketing plan Delco Realty Group develops is very personal. Tuesday, November 22nd, 2011 at 4:49pm.